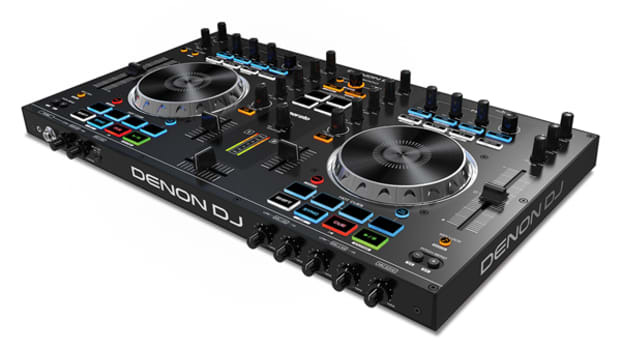 The Denon DJ MC6000MK2 is an update to their original top-of-the-line controller which adds Serato DJ compatibility, Slip Mode, Aluminum-Top Jog Wheels, the Loop Roll feature, and more. The MC6000MK2 is a high-powered and well-built four-channel DJ controller and standalone mixer that has the versatility to work with all popular DJ software. This versatility makes the MC6000MK2 a mobile DJ’s dream with that same durable build quality and compact footprint that made the original a huge success. 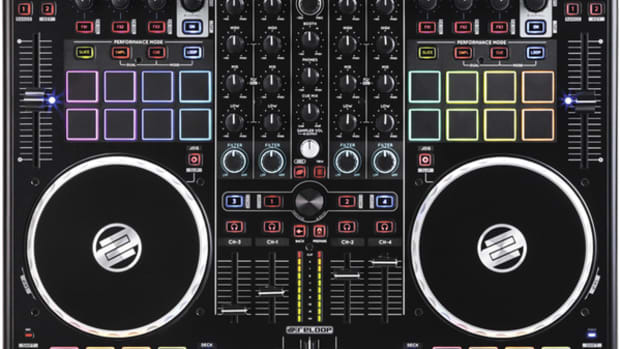 The MC6000MK2 comes bundled with Serato DJ Intro but will cost an additional ($129) fee to upgrade to the full Serato DJ software which will unlock all four decks of Digital DJ control. The upgrade will also unlock the additional cue points, the slip-mode feature, the loop roll feature, and more effects options. Since the MC6000MK2 is such a professional quality controller to begin with, we are going to recommend that users upgrade to a Full-featured DJ software for this controller whether it be Serato, Traktor, VDJ, Mixvibes, or whatever DJ software you choose. Denon provides mappings for Traktor Pro 2 on their website and there&apos;s a Virtual DJ Pro mapping right on the VDJ website as well. 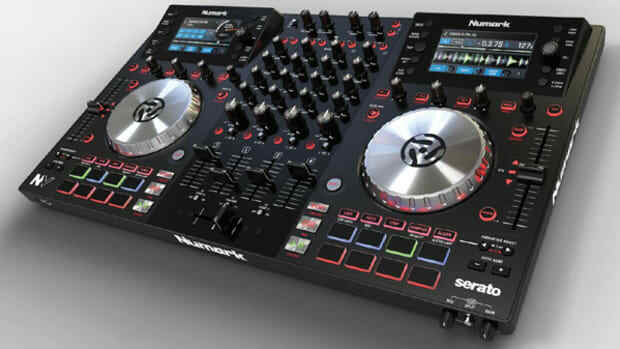 For the purposes of this review, we are using the full Serato DJ software for the testing procedures. The MC6000MK2 comes with a software CD that contains Serato DJ Intro and the drivers for windows machines. You can also go to the Denon DJ website to download the drivers and to the Serato DJ website to download the Intro software. Once the software is loaded up you’re ready to roll. Just add the inputs and outputs to the speakers along with the USB connection to the computer and all should be set to play. No need to go into any preferences to change anything to get it to work. The Serato DJ setup is always pretty simple and the MC6000MK2 is no exception. On a side note, the MC6000MK2 is not USB powered, so the power pack must be attached to an outlet before the unit can work. The build quality of the MC6000MK2 is excellent. The entire body is made of metal and everything really feels super-sturdy. The knobs all have metal posts underneath and it definitely feels like it will to last a long time. The Jog wheels now have a metal top on them for a slightly better feel and a nicer look. The overall size of the MC6000MK2 is very compact for a four-channel and full-featured controller. 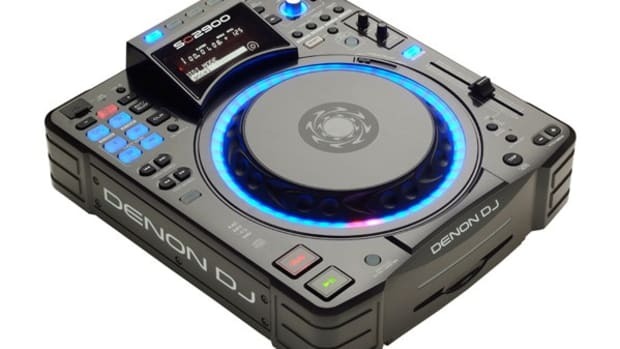 The Denon MC6000MK2 also has an optional rack mount kit available called the “RM6000” for DJ&apos;s wish to mount the device to a coffin or case. 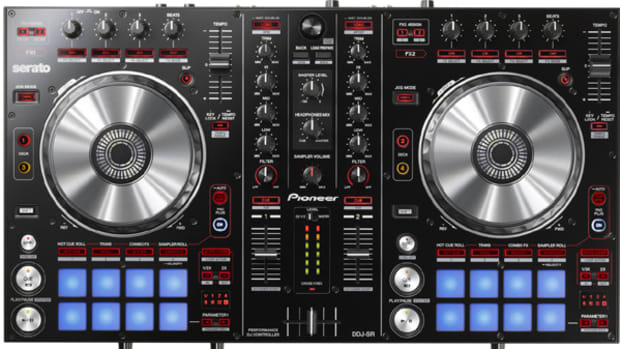 The MC6000MK2 overall layout has been slightly changed and improved to work with the Serato workflow. The monitoring/headphone controls have been moved to the front of the unit and the pitch sliders have also been moved to the lower outsides of the jog wheels for easier manipulation. The buttons for hotcues, transport controls, samples, loops and effects have also been slightly changed in form and they are all rubberized with a backlit so that the user knows they are active at a glance. The other buttons are all small and hard plastic for navigation and other utility options. The new layout seems to be less "cramped" than the first MC6000 even though they share the same footprint. The Denon MC6000MK2 has small but sturdy, metal-top High-resolution touch-sensitive jog wheels that has a really good low-latency operation when used with Serato DJ. The Jog wheels are rather small and they may take some time getting used to for those who use bigger players. The size of the controller is pretty small, so the jog wheels will also suffer from this limitation. Still, the jogs are more than adequate enough for scratching and mixing purposes as everything feels one-to-one in operation. Below the jog wheels are the rubber transport controls (Play/Pause, Cue, Sync) and the Pitch Bend buttons to get the BPM’s just right. There’s also a Vinyl button that turns the jog wheel from vinyl mode to pitch bend mode depending on your preference. The Pitch sliders feel very solid and they are now moved to the outsides of the controller so they don’t interfere with other controls. Above the Pitch sliders, there is a Key Lock button that doubles as a Tempo Range button when shift is pressed. Above the jog wheels is the Censor button that will temporarily play the track backwards as long as it is held in order to remix on the fly or eliminate curse words. When in the full Serato DJ software, the Censor button doubles as a Slip-Mode button when shift is pressed. There’s also Deck select buttons that change the deck controls to Deck 1 and 3 on the left and Deck 2 and 4 on the right. Above the jog wheels are the four buttons that control Hot Cues and Samples. There aren’t any performance-pads here like on other recently released controllers, so Denon decided to go for a more traditional and sleek representation of these functions instead of going with the norm. These buttons share a function, so the user has to select whether they are operating as Hot Cues or as Samples. Notice that there are only four of them available at a time so this may not be suited for those DJ’s who want to really “perform” and remix with the hot cues and samples buttons. However, the buttons do perform just as they should and they are rubber and they are also very responsive. Above the hot cue/sample buttons is a Loop section with Loop-In and Loop-Out buttons and an Auto loop button with plus and minus buttons to grow and shorten the loops on the fly. The Auto Loop button doubles as an Auto Loop Roll when shift is pressed in Serato DJ. Loop-Roll allows the loops to activate at a set length, but when the loop is released the track continues to play as if the loop was never active. It’s basically a slip-mode auto loop function. The MC6000MK2 also has the familiar two Effects Bank sections located at the top of each deck. These effects sections include three knobs and buttons to engage and change the effect parameters you have selected in the software of your choice. The fourth knob is a Beats encoder that allows the user to change the beat effect parameters on the fly. The layout is extremely similar to what is found on the other Serato and Traktor effects sections of today. Under the effect knobs and buttons there are four channel assign buttons and a tap button to control how the effects are applied. 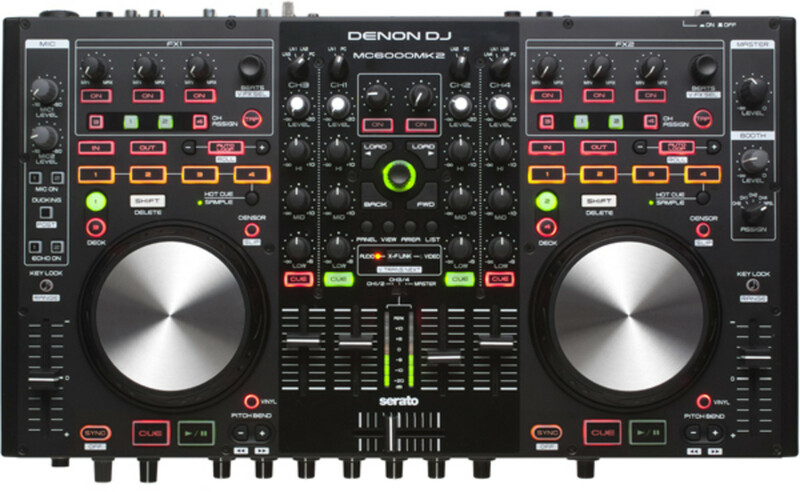 The Denon MC6000MK2 can be used as a stand-alone mixer meaning that the user can connect up to four additional sources (decks) into the RCA inputs around back and DJ without using software or a computer. There are four RCA inputs on the back (two can be switched to PHONO level for vinyl decks) and two Microphone inputs which have separate 3-Band EQ (on the front panel) and volume control knobs (on the top panel) for DJ’s in performance scenarios. The microphone inputs are XLR/TRS combo for MIC1 and TRS for MIC2. The Microphones have on/off buttons on the top panel along with Echo ON buttons to add a little extra to the microphone performance. The Echo control knob is also on the front of the unit. The MC6000MK2 does support DVS pass through on the RCA inputs but only with software that don&apos;t require proprietary soundcards such as VDJ, MixVibes, and The One DJ. The Denon MC6000MK2 also has a healthy number of outputs with an RCA master output and a balanced XLR master output along with a Stereo/Mono switch. There’s also a separate balanced TRS booth Output with a separate volume control and booth assign switch that allows DJ’s to separate and playback only the selected channel input through the booth output. Users cannot use this function for software or virtual decks, but they can play back individual channel inputs that go through the mixer. All music (virtual & physical) will go through the booth output when master is selected from the booth assign knob. There is also a selector switch that allows the USB port to record the audio output directly to the computer. 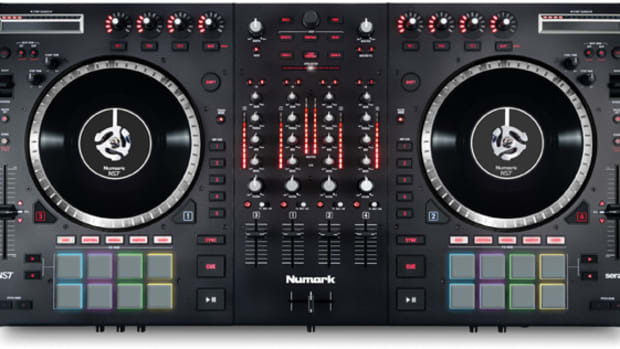 The switch will allow DJ’s to selectively record the external input channels one & two, or three & four, or the microphone inputs. This is especially useful for mobile DJ’s who want to record their live channel input mixes directly to their computer. The original MC6000 had the another RCA Record output that I actually like better than the USB audio output option that replaces it. If you want to record your full Serato DJ set, you will need to upgrade to the Serato DJ full software or use an external recording device through an available output. The crossfader and linefaders are the Alpha type standard with the crossfader having less tension than the linefaders. The crossfader actually had a rather long 2mm cut-in distance that made it a bit harder to pull off the complicated and quick scratching techniques, but users of this device will likely use the MC6000MK2 for other purposes rather than for mainly scratching. All the way to the right of the front panel are the channel crossfader selector switches which allow DJ’s to select the side of the crossfader per each line. There is also a crossfader curve control knob to change the crossfader reaction type on the fly. Also on the front of the mixer is the headphone/monitoring section which includes the ¼-inch headphone input, volume control knob, CUE/Master pan knob, and a split cue switch that allows the user to listen to the Master output in one earcup while the Cue monitor section plays in the other earcup. There are a few minor gripes that I was able to find with the Denon MC6000MK2 but none of them are deal-breakers for most users. The first gripe that I have with the unit is the rather small jog wheels. These are a set of high resolution jog wheels and they operate very nicely in Serato DJ with super-low latency. With that being said, if you are used to decks or turntables with a bigger surface area, it will take some time getting used to the smaller area of the jog wheels. The next gripe that I had was with that the MC6000MK2 doesn’t come with a full featured DJ software. The MC6000MK2 only comes bundled with the limited two-channel Serato DJ Intro that cannot control all four decks of the device straight out of the box. The user must pay the upgrade fee to unlock its full potential. 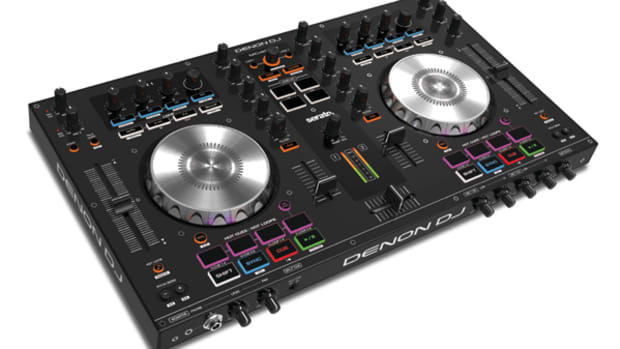 It would have been nice to get the full Serato DJ software in the box, but perhaps Denon was doing this to allow the user to choose the software of choice without raising the price of the MC6000MK2 and locking the user into a Serato DJ experience. Either way, the user will want a full software version to get the most out of this controller. 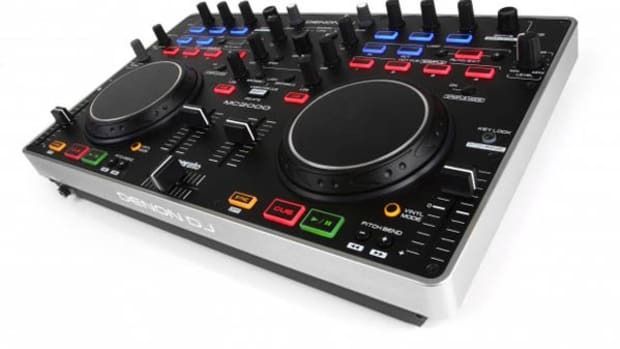 In conclusion, the Denon MC6000MK2 is one of the BEST (if not THE Best) all-in-one compact four-channel Digital DJ controllers on the market for Mobile DJ use. It has a very compact and heavy-duty metal construction, can work as a four-channel standalone mixer, can be used with almost any DJ software, and has an intuitive/no-nonsense controls over the effects, samples, hotcues and looping functions. The MC6000MK2 also has two microphone inputs with their own separate three-band EQ, echo controls, and volume control knob making this an ideal device for Mobile DJ’s or those who do ceremonies. The Denon MC6000MK2 is one of the most capable and versatile controllers to date that we will recommend to any Professional or Mobile DJ who wants a compact and sturdy DJ/MIDI controller to complement their existing DJ setup or to bring their setup on the road with high quality standards in mind. The MC6000MK2 doesn’t have all the over-the-top pads and crazy DJ functions like the beatslicer, but it is a great workhorse controller for DJ’s who need to get the party going while using the core functions that DJ’s need for live performances and weekly gigs. We also recommend this unit to Bedroom or Studio DJ’s that want a professional package in a small footprint for limited space or storage.